Assiba Table Lamp designed by Mauro Olivieri is inspired by the ocean life in its color, shape, and textured. 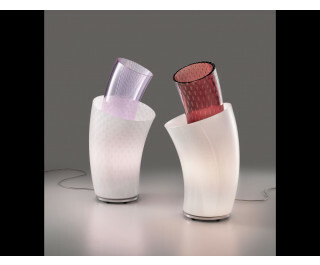 It allows infinite possibilities thanks to the rotating inner diffuser, made of glossy blown glass. Available in the following color combinations: White with an Amethyst inner diffuser, White with a White inner diffuser, White with a Crystal inner diffuser, Crystal with an Amethyst inner diffuser, or Crystal with a Crystal inner diffuser.